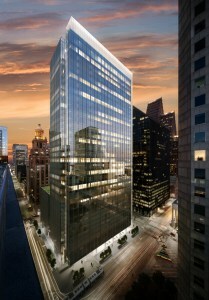 Rendering of Skanska building under construction in downtown Houston. Architecture by Gensler. HOUSTON – (Realty News Report) – Waste Management has signed a 15-year lease with for 284,000 SF in Skanska’s Capitol Tower, which is under construction in downtown Houston. Waste Management will move its headquarters from 1001 Fannin to the Skanska building in 2020. With this lease, the office portion of the building is now 72 percent leased. The 35-story office tower will be located on a block bounded by Capitol, Rusk, Milam and Travis streets, will be complete in the first half of 2019. Warren Savery, Kristen Rabel of CBRE represented Skanska in the lease. CBRE’s Rich Pancioli, Jon Lee and Lisa Konieczka represented Waste Management. “Working with CBRE we evaluated many great options and feel confident Capitol Tower will provide a unique and collaborative platform for our new corporate headquarters space. Capitol Tower offers us high-end desirable amenities, along with a great location within the Houston CBD to support us in continuing to move our business forward for many years to come,” said Jim Wilson, Senior Director of Real Estate for Waste Management. The building is the first office development in Texas to achieve LEEDv4 Platinum pre-certification. “The building will be one of the most sustainable office buildings in Texas and supports our company commitments to conserving natural resources,” said Jim Fish, president and CEO of Waste Management. Another major tenant, Bank of America has leased 205,000 SF of office space in the building and has acquired the naming rights. The new building, designed by Gensler, will have 754,000 SF of office space and 26,000 SF of retail. The building, 800 Capitol St., which will have extensive retail and restaurant space in the tunnel level. The building, constructed on the site of the old Houston Club building, is at a key underground intersection of downtown’s tunnel system, linking many buildings in the CBD. Houston Club building was imploded in 2014. The foundation for the Skanska building was poured in 2015 and the initial levels of the parking garage were built.